Cefixime Trihydrate is an orally active antibiotic with similar antibacterial spectrum and resistance to β- lactamase as third generation cephalosporins. It inhibits an enzyme transpeptidase which is responsible for bacterial cell walls synthesis. 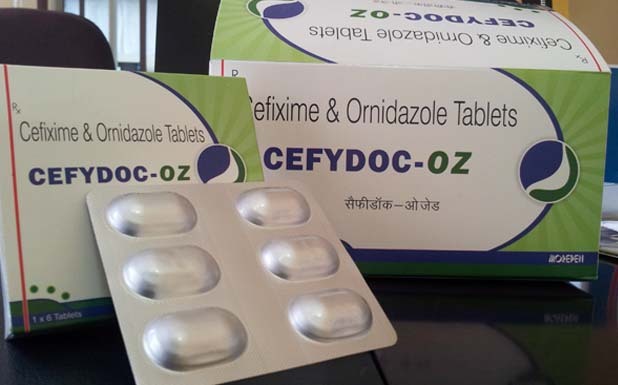 Ornidazole is a drug that cures some protozoan infections and prophylaxis of anaerobic bacterial infections.It is an antimicrobial agent for the treatment of infections due to trichomonads, amoebae, Giardia lamblia and anaerobic bacteria. ● Infections caused by susceptible organisms. ● Gives better patient compliance. Cefixime is an orally active 3rd generation cephalosporin which exerts its bactericidal action against both gram positive & gram negative organisms by inhibiting bacterial cell wall synthesis. Cefixime inhibits transpeptidase & thus prevents cross linking of bacterial cell wall. Transpeptidase & associated proteins constitute various types of specific binding proteins which have affinity for cephalosporins like Cefixime. It is highly active against enterobacteriaceae, Haemophilus influenzae, Streptococcus pyogens & Streptococcus pneumonia &many beta lactamase producing bacteria. Absorption: Absorbed orally up to 50 % & food delays absorption. Metabolism: A portion of drug is metabolized in the body. Excretion: Excreted mainly through urine. Onset of Action for Cefixime: Within one hour. Duration of Action for Cefixime: 18 hours. Half Life of Cefixime: 3 hour. ● Drug enters the cell by diffusion. ● Nitro group of drug is reduced by redox proteins present only in anaerobic organisms to reactive nitro radical which excerts cytotoxic action by damaging DNA and other critical biomolecules. ● DNA helix destabilization &strand breakage has been observed. Metabolism: Metabolized in liver by conjugation. Excretion: Excreted in urine and small portion is excreted in bile. Onset of Action for Ornidazole: Within 2 hours. Duration of Action for Ornidazole: 14hours. Half Life of Ornidazole: 12 to 14 hours. ● Hypersensitivity to the drug or other imidazoles. ● Probenecid: Increases and prolongs the effect. ● Oral Anticoagulants: Effects of anticoagulants potentiated. ● Potentiates effect of coumarin-type oral anticoagulants. ● Prolongs the muscle-relaxant effect of vecuronium bromide. ● Special Precautions should be taken while taking Cefixime incase of Renal impairment. Also patients allergic to peniciilins should be carefull while taking cefixime. Use cautiously along with salicylates & Probenecid. Use with caution during pregnancy and old aged patients. Contraindicated during breast feeding. ● Special Precautions while taking Ornidazole in cases of ailments like Vertigo, Mental confusion and Ataxia. Use with caution in pregnancy and it is contraindicated during the First trimester of Pregnancy. Use with caution in old age patients as well as children.